Recording engineer, producer, composer, and multi-instrumentalist. Doug has had a passion for playing and recording music for over two decades. Doug graduated with honours from the Pacific Audio Visual Institute in Vancouver. Since returning to Saskatchewan, he has worked with numerous acts including Ultimate Power Duo (New Normal), Smoke Killer (13) and Ritual Rabbits (Somehow Never Again). 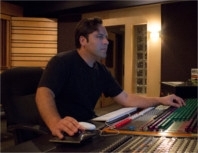 In 2007, Doug co-founded Theta Lab Post-Production Audio which completed many television series (including a Gemini award-winner), short films, television commercials and web-based content. Doug is also experienced in the production side of film making, having done location audio for documentaries, commercials and feature films.